Pack Like A Pro ❤ Master the art of packing with this versatile and clever toiletry bag. No longer will you have to buy those tiny travel bottles, because this bag is large enough to fit your favorite everyday toiletries. Just zip up and go! And the whole bag folds down flat to take up minimal space in your luggage. Multifunction & Hang For Easy Access ❤ Our Waterproof Travel Bathroom Bag will not be more unpacked and mess up your countertop. 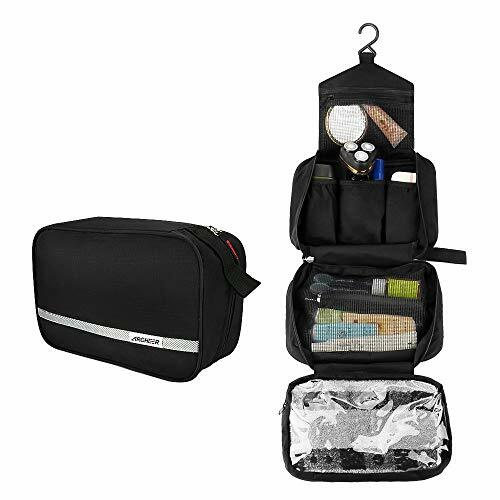 This Travel Bathroom Kit Organizer utilize the zip around design and the attached hanging hook to hang the shower bag on the bathroom door, shower rod or towel rack for fast access to your hygiene products. Travel Organiser Bag & Cosmetic Bag ❤ Don't spend money on a separate makeup organizer bag when you can fit all you need for travel right in here. Perfect Travel Toiletry ❤ With the unisex design, this bathroom bag is suitable for the whole family.